Episodes were tight in both story and characters, sticking with an individual or smaller group rather than jumping around to check in with everyone in a single hour. This shift gave the show a rare sense of deliberate pacing that kept things moving without rushing. Long gone were the days of wheel spinning at Hershel’s farm or the prison. But going into the finale, I was worried Gimple might not stick the landing. Since the mid-season hiatus, the show has racked up a body count, dropping characters with senseless abandon that felt like a reversion to the show’s more shocking, less interesting form. Gruesome deaths aside (RIP, Noah), the back half of the season did a decent job demonstrating the very obvious PTSD that Rick and company are suffering from. As Michonne, notes when they arrive at Alexandria, they need this; they’ve been outside too long. Indeed, the effects of being “out there” are brought into stark contrast when we meet the Alexandrians, a genial community that has amazingly been walled up inside a virtual fortress since the early days of the zombie apocalypse. Their lack of experience outside has made them soft. They are careless on runs, and fail to realize that, in this new world, the living pose a greater threat than any horde of walkers. Once inside, we get to watch as each character struggles to adjust as they finally have a moment to catch their breath and process the horror they’ve been living for so long. Like I said, the show does a solid job handling the issue of PTSD. It’s commendable that they even attempted to tackle it, but I’m glad they did even if the arcs of less defined characters like Sasha fall flat. Rick’s breakdown, meanwhile, had been a long time coming. All season we’ve watched as bearing the burden of keeping this group alive has taken its toll on him, pushing him into increasingly gray moral territory. Given his current state of mind, it looked like the finale was going to turn in to a bloodbath inside the walls of Alexandria with Rick making good on his threat to take the town by force in order to save it from itself. To the Alexandrians, Rick’s meltdown may have sounded like the rantings of mad man, but he refuses to apologize for it, saying he’s only sorry he didn’t say it sooner (and presumably less crazy). Ultimately, that confrontation never happens as the finale works hard to prove Rick’s point. In short order, walkers get inside due to carelessness, and Deanna is very brutally forced to admit that her brand of gentle justice has no place in this new civilization. While it makes for tense television, it’s kind of a letdown. 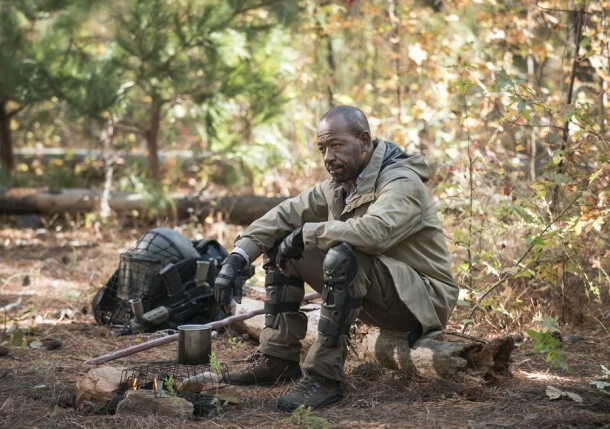 After a season that did a great job complicating the moral equation and painting our heroes as increasingly desperate, the finale resets the status quo and only justifies Team Rick’s paranoia and ruthlessness. Critic Zack Handlen makes a good case for this in his AV Club review, suggesting that if the show wants to keep things so black and white, it’d be better served by putting the group against less ambiguous antagonists. With our first glimpse of the Wolves in the finale, it looks like next season’s big bads will fall squarely into that category. It looks like Morgan (Lonnie James) will finally be back in the fold moving forward, which is great news because he’s a goddamn badass. I’m really disappointed Gabriel is still alive. I have no interest in his redemption arc. He’s a coward and a back-stabber. Ditto Nicholas (though I’m glad Glen didn’t kill him). The Wolves look like some twisted motherfuckers. That trap at the warehouse was diabolical. So I know consensus is that Rick shot Pete in that last scene, but for a minute I thought Deanna was giving him the go ahead to put down Reg before her turned. But it’s likely the former especially since he did it in front of Morgan who’s new “all life is sacred” outlook should appropriately complicate their relationship.